The Mitsubishi Electric Ceiling Concealed Cassette heat pump range delivers heat from above, freeing up wall and floor space. These heat pumps optimise the space in smaller rooms making them ideal for apartment living and small offices. 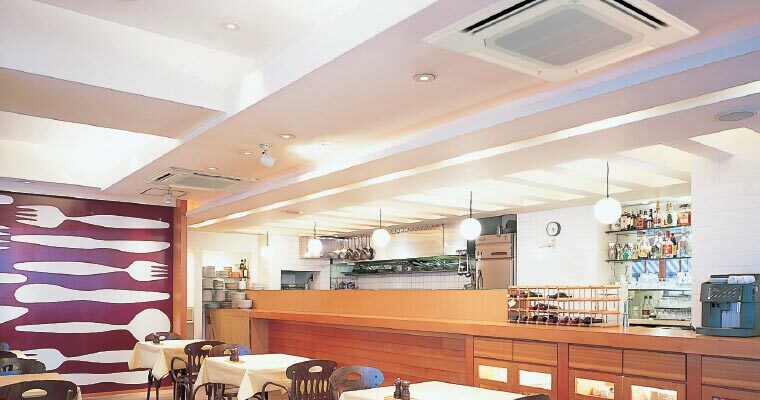 The Ceiling Concealed Cassette heat pump is a lightweight unit installed into your ceiling space. Only the grill is visible, offering a discrete heating and cooling solution. Mitsubishi Electric have designed several different Ceiling Concealed Cassette models to ensure a variety of spaces can be fitted with the appropriate style and capacity. In keeping with Mitsubishi Electric’s whisper-quiet technology, even the highest capacity cassette models operate with little to no sound at all. The built-in filter keeps your air fresh and free of dust and contaminants. During the filtration process, the air is both purified and deodorised. There is a great versatility about the Mitsubishi Electric Ceiling Concealed Cassette heat pumps. The four-way horizontal airflow allows for heat to be delivered to all corners of the room, distributing air quickly and evenly. The 3D i-see Sensor is one of the most advanced features in Mitsubishi Electric heat pumps and is included in the Ceiling Cassette range. The i-see Sensor uses its eight rotating sensors to detect the floor temperature and the number of people present. It then establishes where each person is positioned in the room before delivering airflow directly or indirectly as required. Mitsubishi Electric pride themselves on their whisper-quiet technology. This feature means their heat pumps are the most unobtrusive heating and cooling solution and far surpass any of its conventional counterparts. Recognising how much noise can impact comfort, Mitsubishi Electric aimed to innovate the quietest heat pumps on the market. Starting at just 19dBA, the full range of Mitsubishi Electric heat pumps have been designed to perform as quietly as possible. Given that the sound of a dishwasher sits around 55dBA, Mitsubishi Electric heat pumps are incredibly quiet. Mitsubishi Electric are at the forefront of heat pump innovation and design, which is why we choose their products over any other heat pump supplier. They have a solid commitment to product improvement and their range of heat pumps is nothing short of the best. For their dedication to meeting the needs of their consumers, New Zealanders acknowledge Mitsubishi Electric as a trustworthy and reliable brand. Ceiling Concealed Cassette heat pumps are a discrete heating and cooling solution for your home or office. Call us today to find out more.